For traditional German food, Bruno’s on Bridgeport Way is a must for dining. Peg loves bockwurst or weisswurst (white sausage), made from veal and pork. She likes weisswurst on “brotchen,” traditional crusty rolls. I like German food and Peg, who’s father was stationed in Germany, graduated from high school in Germany and came home with a love for good German food. Oktoberfest is when we think about German food the most, but I’m open for a good wurst every now and then. In the 1970s I belonged to the Tacoma Junior Chamber of Commerce (Jaycees) and we met at the Bavarian for a number of years before they closed their doors. We would dine at the Bavarian even when there wasn’t a meeting to attend. Bruno’s looks like it has two different style dining rooms and one could well be a meeting place for organizations much like the Bavarian, or a party room. For traditional German food, Bruno’s on Bridgeport Way is a must for dining. We had dined at Bruno’s Restaurant twice when they were located just off Pacific Highway. Peg and I had not tried them since the move to Lakewood. Both waitresses were dressed in “dirndl,” or traditional female dress from Austria, South Tyrol and Bavaria variations. Each meal is accompanied by soup made from scratch every morning, served with a roll & butter. Goulash Soup is the original German traditional soup: chunks of beef, tomatoes, potatoes, carrots, celery, garlic, red and green peppers, spices. Hangover Soup is a very tasty soup with chunks of meat, sausage, mushrooms, tomatoes, pickles, potatoes, carrots, celery, leek, parsley, dill, onions, garlic, traditional East-European spices and sour cream. The roll wasn’t crusty enough to be called brotchen, but Bruno just calls it a roll, but does serve them with pats of butter. It was perfect with the soup. Peg only sampled the soups, while I devoured them. Each meal is accompanied by soup made from scratch every morning, served with a roll and butter. I chose the Home Style Meatloaf for my lunch. I chose the Home Style Meatloaf for my lunch. 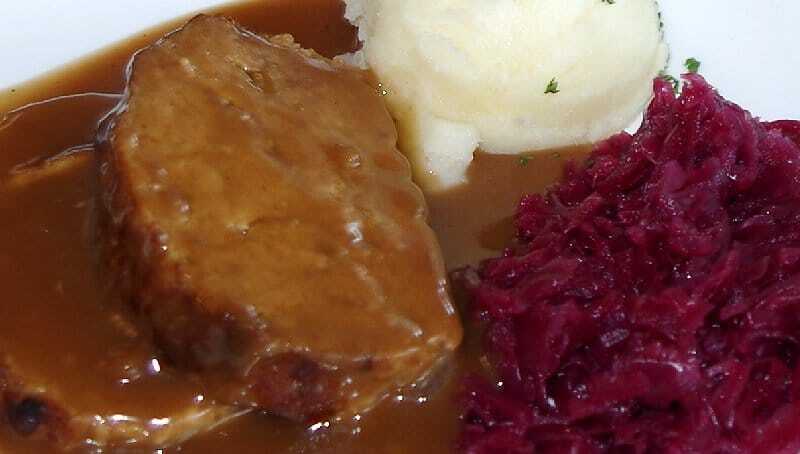 It comes with two slices of Bruno’s meatloaf, covered in brown gravy, served with purée potatoes and one of their salads. Most of the dishes come with potatoes. They even feature a Potato Day coming up on September 16th. I wish Bruno’s was a little more generous with the German mustard; I would like to see a jar of it on the table. Peg ordered Bruno’s Schnitzel – Tender pork cutlet covered with breadcrumbs and pan fried to a crispy golden brown. The wurst was the first to go. Peg ordered Bruno’s Schnitzel – Tender pork cutlet covered with breadcrumbs and pan fried to a crispy golden brown served with purée potatoes and salad. Peg asked for the cucumber salad and it was excellent. Peg really wanted the weisswurst, but it only came as a trio with other sausages. The waitress offered to request the weisswurst as a side for only $3. The wurst was the first to go. For dessert a tray was presented. It’s tough to decide from a small piece. I like to visit the glass dessert case and look at the full cakes. I always have to order quickly because the glass fogs up with my heavy breathing. There was a great selection. Peg ordered the walnut apple cake. I like to visit the glass dessert case and look at the full cakes. I always have to order quickly because the glass fogs up with my heavy breathing. I too love the little dumplings. Jaeger sauce? I will try it out AND ask for more German mustard. My favorite home German dinner is the grilled Weiss Wurst and browned new potatoes with sauerkraut and caraway seeds plus red cabbage and German mustard . . . darn . . . I just had breakfast and I’m hungry again, now! Thanks, again for reading and commenting. I love comments. My wife and I enjoy “Spargelzeit” each year, tho the white asparagus for which the annual June celebration is named is hard to find here. I wonder whether Bruno’s offers it as a special each year. I know they have a potato celebration next month. Enjoy!